Eighteen years. Eighteen years of my life I spent living in The Great Lake State. That’s right, I’m a Michigander, living in the midst of… Ohioans? That doesn’t sound right. From the age I could process my own thoughts I’ve always held this grudge against the state of Ohio. No particular reason why; or I should say, no valid reason. My father is a University of Michigan alumnus. He’s always loved that school and thus has pushed his pride onto his children. The maize and blue have always been my colors and the scarlet and grey will forever be scorned. First, you must view the buckeye as the most ridiculous mascot ever. I mean really? A nut is what you want your school to be represented by? A single wolverine would devour an army of buckeyes. Second, you must always bring up the “more prestigious” academic standards for Michigan. And whenever a friend or family member talks about how Ohio State or some other university has a good *enter major here* program, always say “Ya, Michigan has a top 10 *enter major here* program.” That way, U of M is established as the better school, and the friend or family member’s self esteem will be lowered. Third, always bring up how well U of M has done in the past traditionally. Bo Schembechler is a name you must know. Whenever a loss to OSU happens, just give the overall record in the rivalry (Michigan leads 58-44) and then, again, bring up the better academic standards. Doing this will restore the “feeling better than you” feeling and you can walk away with your head held high. This is what I lived by for the first seventeen years of my life. With further research, though, I found this school to be a leading choice. 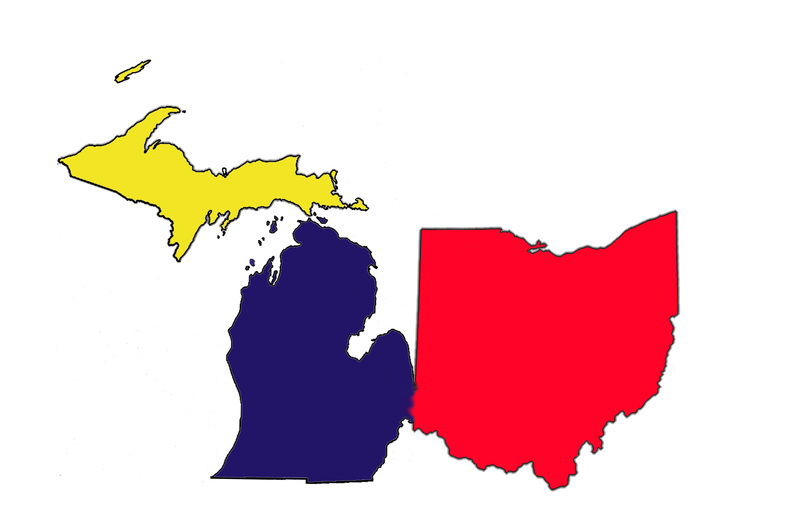 The geography was different than what is thought of being “Ohio” (flat and boring), and it seems to share a mutual hate for OSU and Michigan fans. My father saw that this school was my number one choice, and allowed me to use his money in order to become a student. If you are from Michigan, going to a school in Ohio is quite rare. Most of my graduating class went to Michigan State or U of M. I was the lone ranger going to Ohio University. Turns out, the students here, even the ones from Columbus, couldn’t care less about what state I’m from. But in Michigan, people from Ohio who come to Michigan for school are viewed as people who came over from the dark side. All of the friends I’ve made here care more about who I am as a person rather than my origin and the sports team I supported. I am not saying people from Michigan are shallow, because believe me, I love that state with all my heart, but maybe they need to see things from another perspective. As someone who has now lived in both of the states (and I’ll be spending another three and a half years in Ohio) I have experienced both sides. The grudge I once held against this beautiful buckeye state is now gone, and I am happy beyond belief. Ohio has great people inside its borders and it’s sad I had to physically move myself to the state in order to see it. With that being said, thank you Ohio University for broadening my perspective and helping me realize that good people exist everywhere. Do you think OU students care too much about the Ohio-Michigan rivalry? Let Jordan know via Twitter, or comment in the section below. We are proud ouf our Grandson, Jordan Randall, and that he has seen the beauty of our native state, Ohio, as well as that of the people of the Buckeye State.